Ueki-ichi (Plant Fair) is held on the same day as a festival day at Sengen Shrine (popularly called O-fuji-sama). Sengen Shrine is located at 5-3-3 Asakusa, Taito-ku and diagonally across from the Asakusa Police Station. For this reason, Ueki-ichi has become another name for the festival day. In the past, Sengen Shrine was managed separately by Shuzenin, a branch temple of Sensoji Temple, but after Shuzenin was abolished in the mid-Meiji era, Sengen Shrine came under the supervision of the chief priest of Asakusa Shrine. The shrine is dedicated to Konohanasakuya-hime and is said to have been built upon request by Sengen Shrine located in Fuji-gun, Suruga-no-kuni during the Genroku era (1688-1703), but this is not certain. The shrine is said to be located in an unlucky direction or the "demon's gate" when viewed from Mt. Fuji, and since the shrine is on a low hill, it used to command a good view of Mt. Fuji. Since long ago, Mt. Fuji has been the object of religious belief and devotion. Fund drives for Sengen Shrines were carried out and organizations of worshippers of Mt. Fuji ("Fuji-ko") were formed all over the country. On June 1 when Mt. Fuji opened for mountain climbers, people who were not able to climb Mt. Fuji visited one of the Sengen Shrines and worshipped there instead. In the beginning, believers purified themselves with water, put on a white hemp kimono, and began worshipping at daybreak. After the Genroku era, the number of child worshippers began to increase and they worshipped with their hair untied and loosened, as if they had purified themselves. Long ago, the festival days were May 31 and June 1, but after the opening day of Mt. Fuji's climbing season was changed to July 1 in the Meiji era, the festival also came to be held on June 30 and July 1. It is unusual for a festival to be held for a total of four days. Stalls selling many items line the front approach to the shrine called Fuji-dori. A potted plant fair has been held on the grounds of the former Rokugo family residence since the Meiji era. The festival coincides with the onset of the rainy season which is the best time for transplanting and the trees bought at O-fuji-sama have long been said to take root well. As a result, this fair has gradually become popular. Nowadays, on the last Saturday of May and June, about 350 nurseries set up shop mainly along Yanagi-dori, transforming it into a jungle-like environment. According to a survey by the Asakusa Police Department in 1995, the fair attracted over 330,000 people during the four days. Snaked crafted from straw have become rare since the end of World War II. They were made by a farmer named Kihachi who lived in Komagome during the Hoei era approximately 250 years ago, who popularized them after he was told in a dream that the straw snakes would offer protection against epidemics or water poisoning. Judged to be miraculously efficacious, the snakes were sold in Asakusa as well. As an old senryu (satirical Japanese poem) depicted, some of the snakes had tongues and others didn't, indicating that the tongues that were made of pieces of red wood easily fell off as people bumped into other. This suggests the excitement of the jostling crowds at the fair. There are various temple festivals for Buddhist deities. For example, since ancient times, the festival for the Kannon has been held on the 18th of the month and the festival for the Jizo on the 24th, and additional days to perform acts of merit have been established since the late Muromachi era. It is said that performing acts of merit on one of these days is equivalent to performing them for one hundred days or even one thousand days. Over time, these special days became very common all over Japan. Of the days on which acts of merit are dedicated to the Kannon, July 10 produces the greatest number of blessings. Worshipping on this day is equivalent to performing acts of merit for 46,000 days. Since the Edo era, this day has been a popular day of worship. The number 46,000 simply signifies a large amount and is similar to the exaggerations that there are 84,000 gates to Buddhism or that "worries and sadness make your grey hair 3000 rimes as long as your height." It is a way of describing how important the providence of Buddha is. There are also said to be 46,000 grains of rice in one sho which means 1.8 liters and also whole of life in Japanese of rice and by worshipping the Kannon on this day, one will have life-long health and longevity. In another explanation, it is said that there are "4 times 6" in one day, and 46 multiplied by 1000 makes 46,000 days. According to one legend, when Minamoto Yoritomo was defeated in the battle of Ishibashiyama, he gathered his men and camped in the precincts of Sensoji Temple on July 10, and his forces numbered 46,000. There are other stories regarding this mysterious number, but they are all mere conjecture. For reasons not clearly known, people in the Edo era thought red corn that was the color of adzuki beans had magical properties to ward off lightning. This became a popular belief, and for two days on July 9 and 10, red corn was sold in the precincts of Asakusa Kannon. However, when corn became unavailable due to a poor harvest in the early Meiji era, Sensoji Temple began offering triangular-shaped charms on bamboo sticks to ward off lightning at the request of visitors. Gradually, these charms came to be valued and by 1934, the corn vendors had all but disappeared. On Yonman-rokusennichi (Day of 46,000 Blessings) on July 9 and 10, 450 stalls selling Hozuki or Chinese lantern plants and 350 stalls selling other items set up shop in the precincts of Sensoji Temple and the lively cries of vendors fill the night air. The ground cherry is a particularly popular type of Chinese lantern plant. It is cultivated at Shikabone-cho in Edogawa from spring just for the two days on which the Yonman- rokusennichi is celebrated in Asakusa. However, the plant often produces a poor crop depending on the weather, which pushes up prices in some years. The Hozuki-ichi is said to have begun over 200 years ago during the Meiwa era (1764 to 1771). According to the Kumo-no-itomaki episode included in Santokyoden, an attendant at a samurai's quarters in front of the gate of Shiba-seishoji Temple found a ground cherry plant while cleaning the garden and recalled that Atago Gongen had appeared to him in a dream the night before. He announced that if adults ate a green ground cherry at Atago Shrine on June 24, a day for performing acts of merit, they could free themselves of any problems and children would be cured of distemper. Some people promptly tried this on June 24, and finding that it was mysteriously efficacious, began calling it a wonder medicine. This was the start of the Hozuki-ichi that is held in the temple precincts. June 24 is the festival day for Jizo, the Buddhist deity of Atago Gongen and visiting and praying on this day also brought the same benefits as praying every day for 46,000 days. It was also originally a day for performing good deeds dedicated to the Kannon, and after the start of the Hozuki-ichi in Asakusa, this fair in Asakusa soon became even larger and more popular than the one in Atago. Since the green Chinese lantern plant has been used since the Edo era as a Chinese herbal medicine to alleviate general fever and discomfort experienced by pregnant women, it appears these claims are not entirely false. 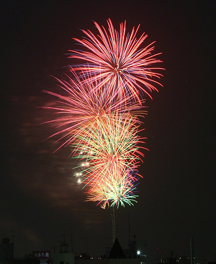 The first fireworks display on the Sumida River was during the reign of the eighth Tokugawa Shogun Yoshimune on May 28, 1733. A festival to appease the water spirit was held and fireworks were set off near Ryogoku Bridge as a way to stem the wave of starvation and illness that was ravaging the country. This river festival at Ryogoku became a tradition that has been continuing for 250 years, but in 1978, the Tokyo metropolitan government and four local wards along the Sumida River formed an organizing committee to revive the Sumida River Fireworks Display. The location was moved from Ryogoku to two sites, one near Imado and the other, between the Komagatabashi and the Umayabashi Bridges. Although the fireworks themselves were small, over 15,000 were set off to the delight of 800,000 spectators who thronged the river banks for the first time in 17 years. This year, approximately 20,000 fireworks will be set off from two sites and 950,000 visitors are expected. The Asakusa Samba Carnival is a midsummer's night dream where the winning team of the Carnival in Rio de Janeiro is invited to perform and young people enjoy a wonderful and exciting evening. This carnival is the result of the planning and vision of Junzaburo Ban, the actor-comedian who loved Asakusa and was also very knowledgeable about Rio de Janeiro and Eiichi Uchiyama, the former mayor of Taito Ward. An organizing committee was formed primarily from volunteers of the Asakusa Small Business Federation. After overcoming many difficulties, the first Asakusa Samba Carnival was held on August 29, 1981. Since then, it has become established as a festival for young people that embodies the new vigor of Asakusa. About 40 teams of approximately 1,500 samba dancers participatein the carnival held on the last Saturday of August. A crowd of 400,000 people look on as the passionate parade makes its way around Sensoji Temple and turns Asakusa into a city that never sleeps.